Were Rage, Gears, and Just Cause sequels just outed by WalMart? Thanks to what is potentially a huge retailer blunder, you can now add a Rage sequel, Gears of War 5, and Just Cause 4 to your E3 rumour pile. Overnight, Walmart Canada published (then removed) a string of placeholder listings including announced games like The Division 2, Beyond Good and Evil 2, The Last of Us II and Final Fantasy 7 Remake; a few games that have been heavily rumoured before like Splinter Cell, Borderlands 3 and Destiny Comet; and one that is clearly wrong in Forza Horizons 5. Of course, WalMart also listed sequels for Gears, Just Cause, and Rage, none of which had been rumoured in any substantial way prior. 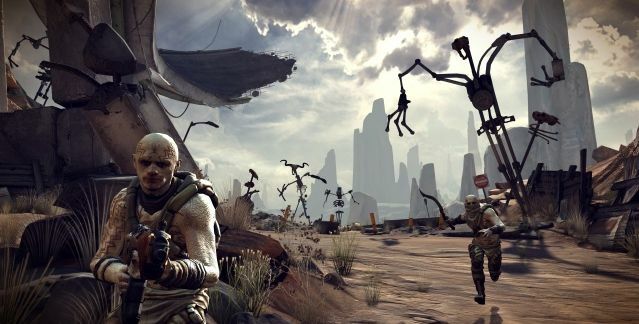 Of the three, Rage 2 is probably the least expected, as the original 2011 FPS was something of a middling effort that John Carmack apologised for at QuakeCon in 2012. Bethesda replied to WalMart via the Rage Twitter account, ribbing WalMart for the low quality of its placeholder art. However, it didn’t deny that Rage 2 was in development. Looks like we'll find out at E3 in mid-June.